Finally the controversial Jair Bolsonaro assumed the presidency of Brazil. In a tone very similar to that of Donald Trump, the new Brazilian president has the practice of expressing his opinions openly on social networks. Its distinctive feature is to systematically move away from the political correctness on sensitive issues. The Brazilian economy fell by 2015 and by 2016 by 7.2%. Although it is experiencing a slight change in trend, the Gross Domestic Product (GDP) is still below that observed before the crisis. According to IMF projections, at this rate, the levels of 2014 will have been recovered by 2020. As a consequence, the generation of jobs is still insufficient and mostly in informal occupations, thus crystallizing a very delicate social situation. On these conditions is that Bolsonaro knew how to build his political capital generating hopes for change. In developed countries, 18% of the population is over 65 years old and public pension expenditure amounts to 10% of GDP. In Argentina, the population over 65 years of age is barely 11%, but national and provincial social spending is 12% of GDP. 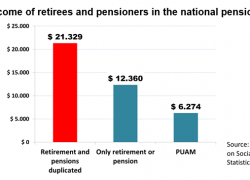 In Brazil only 9% of the population is over 65 years of age and their total public pension expenditure (private and public) is also close to 12% of GDP. 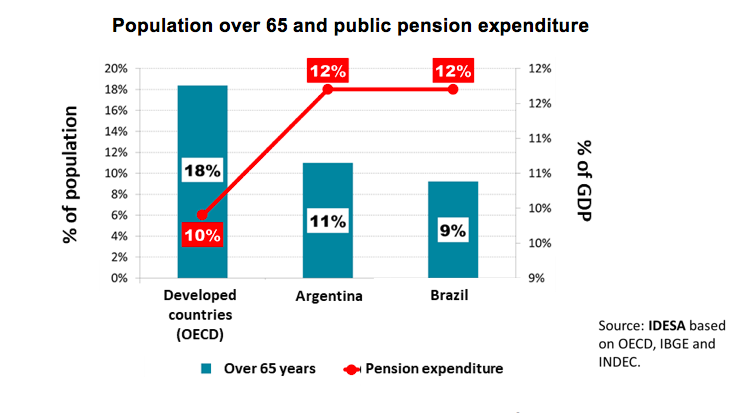 These data show that Brazil, like Argentina, has a pension expenditure that is much higher than what would be expected based on its demography. Brazil spends relatively more than the developed countries in retirements, when it still has half the proportion of people over 65 years of age. Given that the demographic trend is towards aging, the problem tends to worsen in the future. But it is also the main problem of the present because, like Argentina, public spending in Brazil also represents half of primary public spending and has been systematically growing above inflation. The origin of the pension problem is similar in both countries. Special regimes that allow access to pension benefits with few years of service, early ages and amounts that are not proportional to the contributions made. Resistances to seriously address the discussion of the topic are analogous. 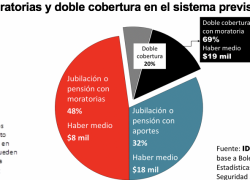 Both in Brazil and in Argentina, the pension reform is shown as anti-popular, the result of enormous confusion regarding the diagnosis of the situation, its implications and the fact that the beneficiaries of these privileged treatments have a high power of influence. Illustrative testimony is President Bolsonaro himself who enjoys an early retirement as every former member of the armed forces. Finally, both countries suffer the very negative consequences of an exaggerated allocation of public funds to the pension system. This excess destabilizes public accounts and forces to cut back on socially strategic programs, such as those that support children in poverty. Minimizing the pension problem and opting for “gradualism” guarantees the failure of the government plan. 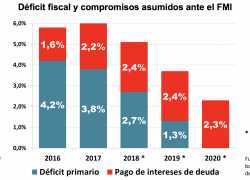 Brazil will make the same mistake as Argentina if, as its chief of staff stated, it assumes that there is no hurry in the revision of pension spending, since there is four years ahead. It seems that it is not taken into account that in both countries with public debt amounting to 80% of GDP the spaces to continue funding deficits are very limited. Brazil is in time to give the pension issue the priority it deserves. Argentina, on the other hand, has already lost four years. 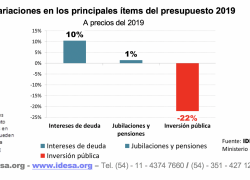 So, for the next government not to improvise and fail again, the ruling party in Argentina should raise the quality and relevance of the electoral campaign by providing information and studies on the public pension system situation.